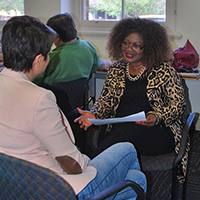 The Community Services Skills Passport offers a range of workshops that encompass the varied skills and knowledge required by those working in the community services industry today. Along with qualification-specific sessions, these workshops will count towards the overall attainment of a qualification, while also providing students with a much broader and more holistic understanding of the sector. The workshops will be scheduled at several times throughout the training year, offering students more flexibility when it comes to how and when they complete components of their study. The rationale for this approach stems from the results of the Community Services and Health Industry Skills Council 2014 Environmental Scan, which highlighted the need for qualifications and pathways that recognise common skills across similar sectors. We need workers with a broader base of skills and training that supports flexibility and improves workforce capability to respond to client-focused and consumer-directed models of care and support. We need workers who can apply their knowledge over a broad range of areas and have the skills required to improve the functioning of multi-disciplinary teams. We need workers who can determine when and how to enlist specialist assistance. The Institute is committed to our students, their learning journey, and making sure they can obtain a quality qualification that enables them to meet their goals of future employment. We believe that the Community Services Skills Passport will provide students with a broad skills and knowledge base that will enable them to respond to client and service user needs as part of a team, as well as the ability to know when to ask for specialist help. The Community Services Skills Passport will provide current and relevant training that addresses these industry needs strategically. For more information about what’s on offer in 2015, come along to one of our Training Information Sessions or contact us on 8245 8100.